Over the past decade there has been a growing public fascination with the complex connectedness of modern society. This connectedness is found in many incarnations: in the rapid growth of the Internet, in the ease with which global communication takes place, and in the ability of news and information as well as epidemics and financial crises to spread with surprising speed and intensity. These are phenomena that involve networks, incentives, and the aggregate behavior of groups of people; they are based on the links that connect us and the ways in which our decisions can have subtle consequences for others. This introductory undergraduate textbook takes an interdisciplinary look at economics, sociology, computing and information science, and applied mathematics to understand networks and behavior. 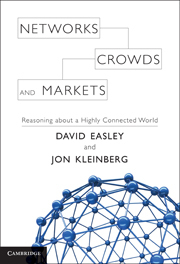 It describes the emerging field of study that is growing at the interface of these areas, addressing fundamental questions about how the social, economic, and technological worlds are connected. David Easley is the Henry Scarborough Professor of Social Science and the Donald C. Opatrny ’74 Chair of the Department of Economics at Cornell University. He was previously an Overseas Fellow of Churchill College, Cambridge. His research is in the fields of economics, finance, and decision theory. In economics, he focuses on learning, wealth dynamics, and natural selection in markets. In finance, his work focuses on market microstructure and asset pricing. In decision theory, he works on modeling decision making in complex environments. He is a Fellow of the Econometric Society and is Chair of the NASDAQ-OMX Economic Advisory Board. Jon Kleinberg is the Tisch University Professor in the Computer Science Department at Cornell University. He is a member of the National Academy of Engineering and the American Academy of Arts and Sciences. His research focuses on issues at the interface of networks and information, with an emphasis on the social and information networks that underpin the Web and other online media. He is the recipient of MacArthur, Packard, and Sloan Foundation Fellowships; the Nevanlinna Prize; the ACM-Infosys Foundation Award; and the National Academy of Sciences Award for Initiatives in Research.